All the point of sale features you need to grow your small business. 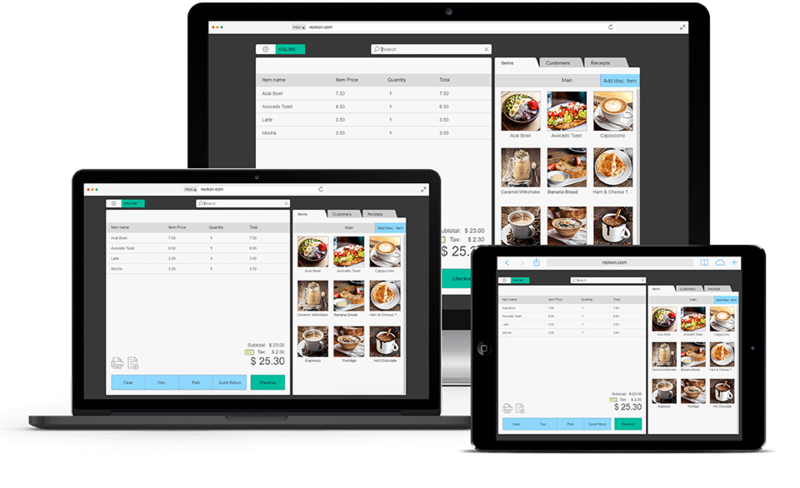 Reckon Cloud POS runs on a PC, Mac, iPad or tablet via your web browser. This gives you the flexibility to take payments at the counter, table or on the go. It even works offline! Reckon Cloud POS combines an easy to use interface with customer-oriented features. So you can be set-up and selling in no time and keep your customers coming back. We offer unlimited products items, unlimited customers, unlimited users so you can grow your business with confidence. Reckon Cloud POS is ideal for small businesses in the retail and hospitality industry including cafes, retail stores, sporting clubs and market stalls as it’s easy to use and provides the flexibility to run POS on the go. It also works offline, so if you do happen to lose internet connection, your transactions are saved on the device and synced to the cloud the next time you’re connected to the internet. 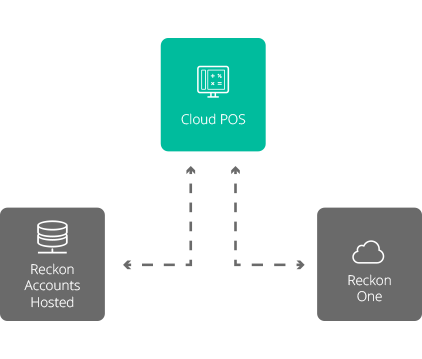 Reckon Cloud POS can be run as a stand alone point of sale pos system or integrated with Reckon One or Reckon Accounts Hosted for a complete overview of your financial position. Start using Reckon Cloud POS on a 14-day free trial and you’ll be up and running in no time. Upload your inventory items and customer data in bulk with our easy to use csv upload template. Customise your point of sale system to what matters to your business including currency, tax rate and quick item shortcuts. Reckon Cloud POS integrates with a variety of leading hardware providers, so you can connect the hardware you need. POS stands for Point of Sale and at a very basic level means the area where a customer completes a transaction. POS software can be thought of like a digital cash register, allowing business owners to process sales and take payments. POS software also typically includes other functionality related to running a store including inventory management, stock control, customer loyalty programs, reporting and employee management. What is cloud-based POS software? Traditional desktop point of sale software is downloaded onto one computer and physically connected to a cash register. Cloud-based point of sale software can be directly accessed from the web and offers a streamlined system that works on most devices and gives users the ability to manage their POS anywhere there’s a wifi connection. Can I run POS software on any device? Reckon Cloud POS is a web-based point of sale. This means your POS software will work on any device including a PC, Mac or iPad. All you need to do to get started is log in via a web browser e.g. Chrome. What are the benefits of a cloud POS system? Using a cloud based POS system gives you the flexibility and mobility to take payments on the go e.g. at your customers table, or at a market stall. Access your POS software anywhere, anytime even when you aren’t physically in store. 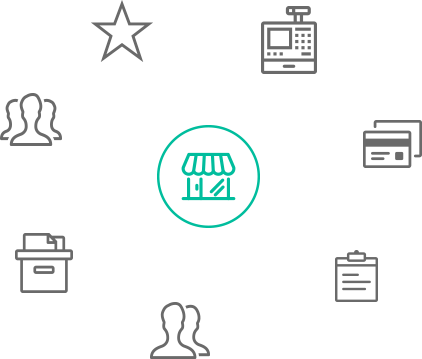 Simply log in to your account and you can see real-time sales figures and run reports or add new products or customers. Cloud based POS software is still relatively new on the market so you get all the benefits of software that has been built with the latest design and user experience principles in mind. Reckon Cloud POS is automatically updated in the cloud. So you’ll always use the latest version with no need to manually download new versions and features. Reckon Cloud POS works online and offline so you never miss a sale even if you lose internet connection. Your data will automatically sync back to the cloud when your internet connection returns. Reckon Cloud POS pricing works on a SaaS (software as service) pricing model. So you pay a low monthly fee instead of larger upfront payment for your software licence. Paying month to month also means you aren’t locked into a contract and can cancel anytime. Your data is safely stored in the cloud so you won’t be affected by theft or accidents to physical hardware. All data servers that have 24/7 security and several layers of encryption. Cloud based software makes it a lot easier to integrate add-ons or connect with other software applications. Reckon Cloud POS integrates with PayPal and Reckon One with more integrations coming soon.